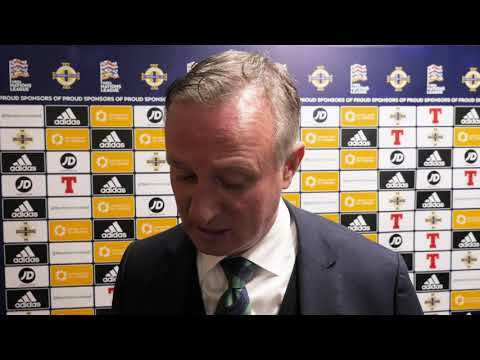 Northern Ireland boss Michael O’Neill says the inclusion of several Under-21 players in his squad for the forthcoming games against the Republic of Ireland and Austria is reward for their performances during their Euros qualifying campaign. Paul Smyth, Jordan Thompson and Conor Hazard were today named in O’Neill’s 28-man panel. O’Neill said the trio, along with recent call-ups Gavin Whyte, Jamal Lewis and Bailey Peacock-Farrell, will benefit from the experience and inject fresh impetus into the squad. “They deserve to be there,” O’Neill said. “They had a fantastic campaign under Ian Baraclough, narrowly missing out on the opportunity to go to the finals. Next Thursday’s friendly in Dublin will be swiftly followed by Northern Ireland’s final Nations League match against Austria in Belfast. “We’ll approach this as if it’s a double-header, similar to what we would have in the qualification for Euro 2020 that lies ahead,” O’Neill added. “The turnaround between Thursday is difficult and a number of our players – the younger ones in particular – have not experienced the intensity of two competitive games. This is another opportunity to put another layer of preparation on it for them and to give them the experience. Having declared himself unavailable for last month’s games, Kyle Lafferty is named among the forwards. Having bagged 20 international goals, O’Neill is keen for the Rangers striker to kick on and chase down David Healy’s record of 36. “Much was written about Kyle not being available the last time so it’s good to have him back. Kyle, when he’s focused, is still our most proven goal scorer at international level. He’s our second all-time goal scorer behind David Healy and he still has a few years left in him and I know it’s a target he’d like to get closer to. It’s down to him now, really.